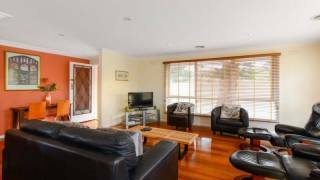 Spacious, 2 bedroom 1 bathroom, serviced accommodation in Sandringham, Victoria. Comfortable, 4 star, fully furnished unit, located just a short stroll from the beach, local shopping and public transport offering pet friendly accommodation. When you step inside, you will enjoy spacious, open-plan living, which has been colourfully furnished with a modern, contemporary style. The living room offers comfortable sofas, a flat screen, high-definition TV, DVD player and mini CD stereo system. The Foxtel Standard package is included for your viewing pleasure including 30 channels across sport, entertainment, news, documentaries and movies . The fully kitchen facilities include a dishwasher, gas cook-top, electric oven, microwave and fridge/freezer with a dining setting for 4. A split system in the living room and freestanding heaters in the bedrooms provide warmth throughout this quality accommodation during the winter months and when you need to stay cool, there's a split system air conditioner in the lounge/dining area. You will also enjoy complimentary ADSL Bigpond broadband internet connection and free local phone calls. 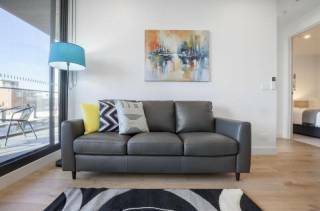 Sandyside 1 is fitted with all the comforts of home making it well suited for those wanting short-term accommodation to relocate to Melbourne, Australia. 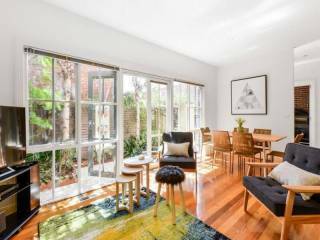 This serviced accommodation in Melbourne is ideal for 2 couples or a family for their next holiday in Victoria and pets are welcome on arrangement. If you are into sailing you will be within close proximity to major attractions including the ISAF Sailing World Cup and The Asia Pacific Regatta. Other local attractions include the Sandringham Yacht Club, Picnic Point and the Sandringham Hotel. 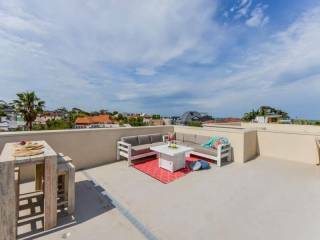 Sandyside 1 is conveniently located near the beach as well as the cafes and local shops of the Sandringham Village all within 10 minutes walk. The bus will take you on a direct route to Southland shopping centre and you can also catch a train from the nearby Sandringham Station into Melbourne CBD (only 16kms). Payment of deposit or total fee for your booking indicates acceptance of these Terms and Conditions. Payment will be made by credit card only, unless otherwise agreed by Boutique Stays. A deposit of 50% of our total fee is required to confirm your booking if you book more than 3 weeks prior to your arrival. If you book less than 3 weeks prior to your arrival, the total fee (ie 100%) must be paid to confirm your booking. The balance of payment will be charged to the same credit card that was used to pay the deposit (unless we are informed otherwise), 10 days prior to your arrival. A security deposit of $700 is required when the balance payment is due. Security deposits are held until after your departure and following inspection of the property. Funds may be retained from the security deposit if these Terms & Conditions have been breached, or if additional cleaning is required, or if there have been breakages or damages. Use of American Express incurs a surcharge of 3.3%. There is no surcharge for Mastercard or Visa credit cards. If you cancel or reschedule your booking less than 6 weeks prior to the scheduled commencement of your stay, your deposit is not refundable if, after making all reasonable efforts to do so, we are unable to obtain an alternative booking of equal value. A minimum $100 cancellation fee will apply to all cancellations or rescheduled bookings. If the booking has been made via a 3rd party booking agent, additional cancellation fees may apply to cover any commissions paid. We strongly recommend that you have travel insurance to cover you in the event of an unforeseeable cancellation. Once full payment is made, no refund will be given. Our right to cancel - we reserve the right to cancel your reservation if we have made a mistake in relation to the price of your stay. We will ensure that we notify you of such mistakes within a week of your booking, provided your stay has not yet started. 15. The number of guests staying at the property must not exceed the number agreed to in the booking details. In the event that any additional persons stay at the property, an additional fee may be charged according to our usual rates and/or we reserve the right to terminate the booking without refund. 16. If pets are entering the property or staying at the property (only allowable for pet friendly properties), the type and number of pets must be disclosed at the time of booking, otherwise we reserve the right to terminate the booking without refund. In that case we will not be responsible for finding or funding alternative accommodation. All disclosed pet stays will be referred to on your invoice and there is a surcharge for pet guests. Please bring your pet’s bed or a sheet/blanket so they have their own sleeping and resting place as they not permitted on beds, couches or any other furniture. Before departing the property you must clean up after them thoroughly including removing any droppings from courtyards or gardens. If pet hair is found on beds, blankets, couches or cushions or any other soft furnishings guests will be liable for any necessary cleaning and dry-cleaning. If pets damage any furniture by scratching or chewing, guests will be liable for any repairs or replacements. If necessary these costs will be charged to the credit card left as security on your booking. 17. All pets at Boutique Stays pet friendly properties are to be flea and tick treated, fully vaccinated, and well behaved. Well behaved means under control at all times allowing neighbours quiet enjoyment of their properties. Dogs are to be on a leash when in common areas or driveways, and are not to be left in the house/apartment, on decks/balconies, or in yards for prolonged periods of time unattended. If guests are absent from the property during the day for extended periods, they will make arrangements to have their dog attended to throughout the day. If dogs are left alone and bark constantly during the day this contravenes local noise laws, upsets neighbours and guests may be asked to vacate the property without refund. 18. All Boutique Stays properties are non-smoking indoors. We reserve the right to terminate a guest's stay without refund if we become aware of guest's or friend's of guests smoking indoors. There may also be additional cleaning fees to remove any smoke fumes from the property. 19. You will agree to any other reasonable house rules which may be made available to you at the property. 20. In the case of Boutique Stays properties which are part of a residential apartment complex, guest are required to enter and exit the property quietly. 21. For all properties, the noise level must be inaudible from neighbouring properties between 10pm and 8am Sun-Thu, and between 11pm and 9am Fri-Sat. 22. All guests are expected to behave in a manner that does not cause distress to neighbours or interfere in any way with their right to enjoy their properties. We reserve the right to remove guests who do not adhere to this code of behaviour. In these cases, no refund will be due, and we will not be responsible for finding or funding alternate accommodation, nor will we be responsible for any other associated costs. 23. Guests may not engage in any illegal activity at the property. 24. The owner or the manager of the property may need access to the property occasionally. We will notify you by email or phone at least 24 hours prior, unless we have made verbal arrangements or it is a matter of urgency. If however we have reason to believe that he property is being used for any reason that contravenes our terms and conditions we reserve the right to enter the property without notice. 25. Check In and Check Out procedures will be detailed in the Property Information package forwarded to you following payment of deposit. Whilst we are more than happy to provide early Check In and late Check Out wherever possible, this can only be confirmed at the last minute as it is dependent on other bookings at the time. Failure to adhere to those procedures could result in the incurring of additional costs. 26. You are responsible for leaving the property in the state in which you found it on arrival. All maintenance issues, breakages or losses must be reported immediately to us. Whilst we will not pursue reimbursement for minor accidental damage or normal wear and tear, the total cost of making good any other damage or loss to the property, garden or contents will be charged for using the credit card provided for payment (or left for security). Please note this includes the removal of consumable items from the property which are provided for guest use whilst in-house and are not intended as individual use presentations (examples include laundry powder, dishwashing liquid, toiletries provided in dispensers etc). 27. It is our policy to have all locks changed if keys are lost or not returned. All associated costs will be charged to the credit card provided for payment (or left for security) if this occurs. Similarly any remote controls will be replaced at your cost if lost or not returned. 28. Standard cleaning services on your departure are included in your rates. Properties may also include interim cleaning services for stays of longer than a week. This will be detailed in your pre arrival information. Guests are expected to leave the properties in a neat and tidy state without the need for extensive, excessive cleaning. You are responsible for all cleaning charges in the event that the property is left in a state that requires more than standard cleaning. This will be charged for using the credit card provided for payment (or left for security). 29. Reasonable usage of electricity, gas any other utilities or services (including internet) provided at the property are included in your rates. Excessive use (more than a 30% increase compared to similar periods) of any of these utilities or services may be charged for using the credit card provided for payment (or left for security). If charges are passed onto the Guest, evidence of charges will be provided on request. 30. Properties which provide local telephone calls included in the rate, do so for up to 6 calls per day. Costs for additional calls may be passed onto guests. 31. Neither Boutique Stays nor the owners of the property are liable for loss to you of any personal belongings while you are in the property. Guest items found by our cleaning staff are kept in the Boutique Stays office for 6 weeks before discarding. It is the guest's responsibility to follow up any items that may have been left behind at the property. We request that guests send a reply paid envelope to Boutique Stays in order for us to return the items. 32. Additional administrative and/or call out charges may be charged if we are required to oversee a breach of Guest Terms & Conditions or attend the property for any other reason apart from scheduled visits. 33. Instructions for how to use the electrical appliances and internet are provided at the property in our Guest Information Folder. If you require assistance with anything, please call the office. Before sending a technician, we will firstly trouble shoot with you over the phone to resolve the issue. If we are not successful, we can then organise a technician to come to the property. However, please note that if the issue is determined to be user error, we reserve the right to pass the charges onto you. 34. Should the smoke alarm within the property be activated during your stay due to a false fire alarm (ie. cooking, burning of candles) you will take full responsibility for all costs incurred by the Melbourne Fire Brigade for attending, should they be called. To avoid such penalties, you agree to contact the Melbourne Fire Brigade immediately on 000 should a false fire alarm occur. You understand that Boutique Stays will not be held responsible for any associated costs for an incident of this nature. 35. You should not wait until you return home before complaining about any matter as no inspection can be carried out when others are occupying the property. We welcome hearing from you in relation to any complaints or concerns and prefer that you phoned us immediately so that matters can be resolved quickly. 36. The place of law is Victoria and the courts of Victoria have exclusive jurisdiction. 37. Your occupation of the property may be terminated by Boutique Stays without notice in the event that you breach any material term or condition or in the event that any amount due is not paid. 38. Boutique Stays enters into this agreement on behalf of the owner of the property and is not liable to you in relation to the property or any services. 39. Boutique Stays is an accommodation booking service and is not a real estate broker, agent or rental company. Whilst all measures are taken to avoid any property being misrepresented by the property owner, Boutique Stays is in no way liable for any advertising misrepresentations as property owners are solely responsible for the accuracy of their listings and information. 40. Neither Boutique Stays nor the owner of the property can be held responsible for failure or interruption to power or services to the property for reasons beyond our control. 41. To the fullest extent permitted by law, Boutique Stays and the owner disclaim all warranties in relation to the provision of services and the use of the property, and otherwise our liability is limited at our option to the supply of the relevant services again or the payment of the cost of having services supplied again. 42. Neither Boutique Stays nor the owners are liable for any indirect, incidental, special and/or consequential damage or loss of profits which result from use of the property and services provided to you. 43. Boutique Stays reserves the right to relocate a booking to an alternative property of similar standard and location at any time. In this instance, guests will be offered either a full refund OR asked to confirm their stay at the alternative property. 44. Boutique Stays advises that the property furnishings may be slightly different to those shown in the property photos. However, if they differ, the furnishings will be of the same standard as that shown in the pictures, or higher.